As a wine lover, you must surely have a place in your heart for Rías Baixas, the lovely, Albariño-based white wine from Northern Spain. * Crisp and floral, fruity and refreshing, the wines of Rías Baixas are a white wine lovers dream. However…do you know what a ría is? The word itself sounds a lot like “río,” so you might just assume that it is a local term for “river.” In which case, you would be just a little bit correct. Estuary: A partially-enclosed body of water, located on the coast, formed where one or more streams or rivers flow into the ocean. An estuary contains a body of brackish water (a combination of salt water and fresh water) and has an open connection to the sea. A ría is therefore a type of estuary, also known as a drowned river valley or a coastal plain estuary. Rías were formed at the end of last ice age at places where the level of the sea rose in proportion to the coast, and sea water seeped inland into the river valleys. Rías retain the original shape of the river and are usually quite shallow. Rías typically have very rugged, jagged outlines and often include islands as well. In the United States, Chesapeake Bay, Delaware Bay, and Galveston Bay are all rías. Well-known rías in other parts of the world include Marlborough Sounds (on the northern tip of New Zealand’s South Island), Sydney Harbor in Australia, and the Fiordo di Furore in Campania, Italy (which is technically a ría despite its name). 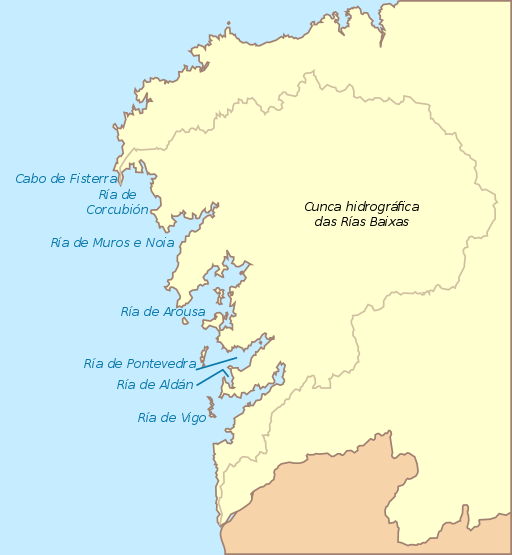 The coast of Galicia is lined with rías. Those in the north are referred to as the “Rías Altas” (Upper Rías) and are aligned along the “Coast of Death.” Well, the area is not technically referred to as the Coast of Death, but the Galician “Costa da Morte” is a nickname for the region, so-called for the turbulent nature of the waters that in the past led to many shipwrecks. The Ría de Muros e Noia; formed where the Tambre River meets the sea. This is the smallest of the four rías and the only one not to have an island near the mouth. The Ría de Arousa; formed where the Ulla River meets the sea. This is the largest of the five rías. The Ría de Arousa has two lagoons, as well as a large area of sand dunes known as the Dunas de Corrubedo. The Ría de Pontevedra, located around the delightful, vacation-worthy town of the same name, is located where the Lerez River meets the sea. This ría contains a small inlet known as the Ría de Aldan. 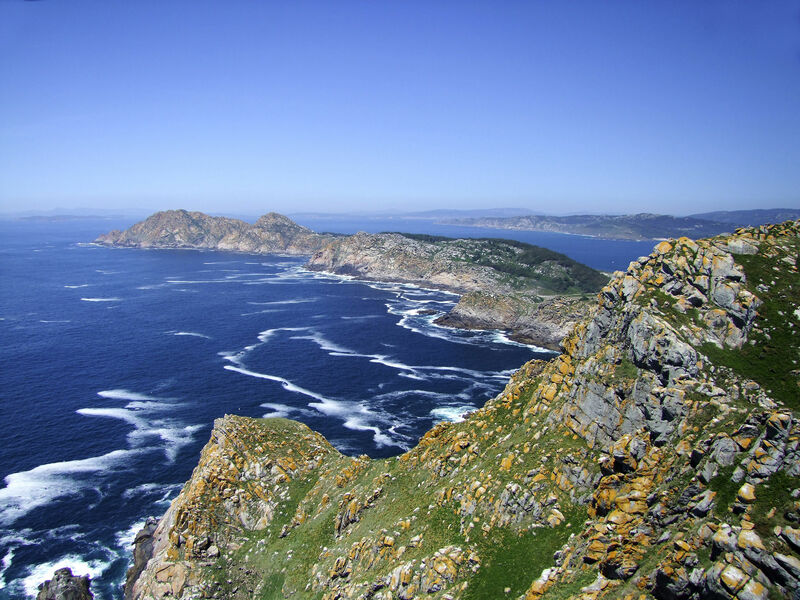 Two small islands, Isla Ons and Isla Onza, are situated at the mouth of the ría. The islands are part of the Parque Nacional Marítimo-Terrestre de las Islas Atlánticas de Galicia. 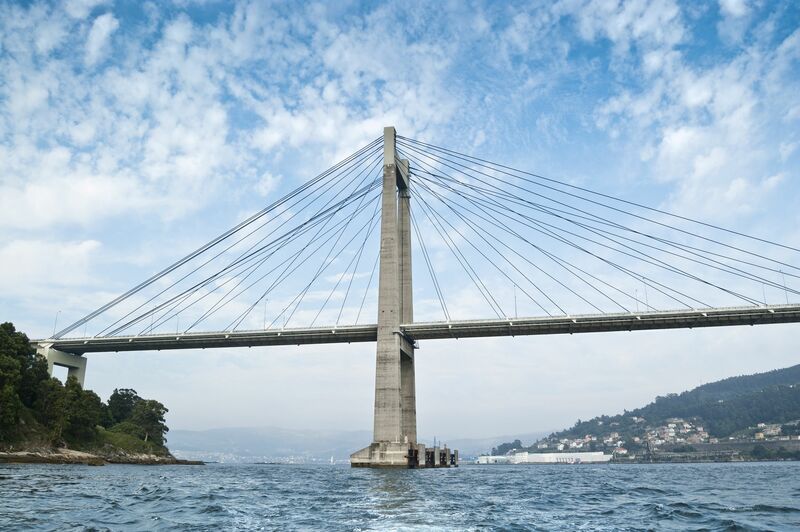 The Ría de Vigo, the southernmost, is formed where the Verdugo River meets the sea. The Cíes islands, located at the mouth of the ría, make the area a safe port, and many beautiful marinas are located here. 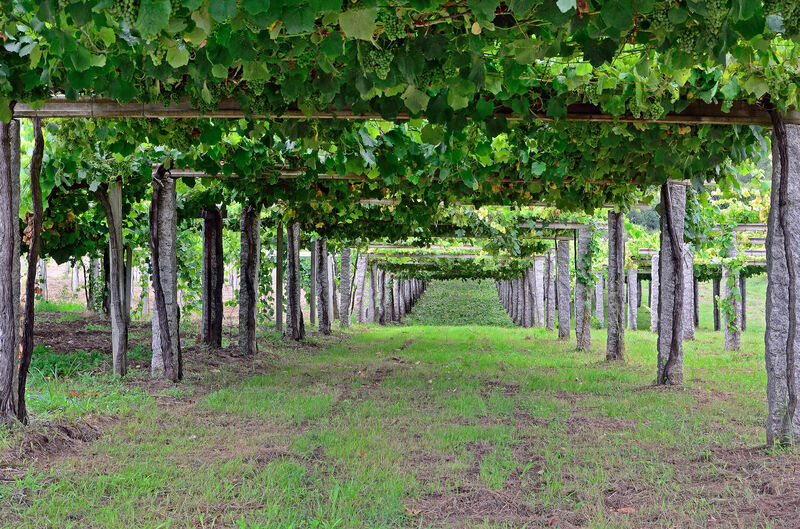 *Technically, the white wines of the Rías Baixas DO may be produced using Albariño, Loureira, Treixadura, and Caiña Blanca grapes, along with small amounts of Torrontés or Godello—in various proportions depending on label terminology and the sub-region. The DO is also approved for the production of red wines based on Caiño Tinto, Espadeiro, Loureira Tinta, Mencía, Brancellao or Sousón. Fjords: Fjords are deep, steep-sided estuaries formed by glaciers. As the glaciers advanced, they would deepen and widen the original river valleys; at the end of the ice age as the glaciers retreated, they left behind the fjords. Fjords can reach depths of up to 1,000 feet (300 m). The coast of Norway is well-known for its numerous fjords; fjords also make up portions of Puget Sound (Washington State), Glacier Bay (Alaska), and Milford Sound (New Zealand). Lagoons: Common in tropical areas, lagoons are formed in areas where sediment is deposited at the same rate as the sea level rises to form a body of brackish water separated from the sea by a sand spit or barrier islands. Lagoons are typically quite shallow and parallel to the shoreline, as seen in New Jersey’s Barnegat Bay and Italy’s Venetian Lagoon. 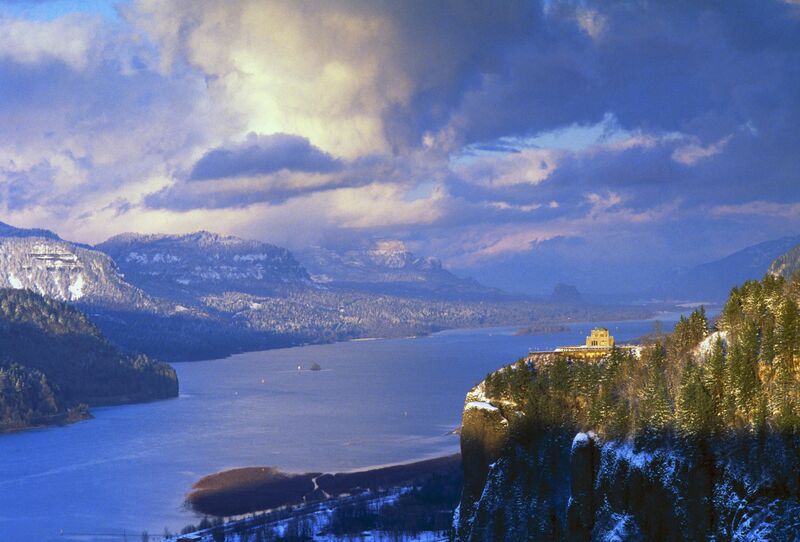 Freshwater Estuaries: Freshwater estuaries occur where rivers flow into fresh-water lakes. The Great Lakes, located in the United States and Canada, contain many freshwater estuaries. Soils underlying the vineyards in Alsace range from the schist and granite of the higher elevations (extending into the Vosges Mountains) to the limestone and chalk of the lower slopes, to the clay and gravel of the valley floors. However, it is the unique, reddish-colored sandstone of Alsace—known as grès des Vosges—that inspired this post. 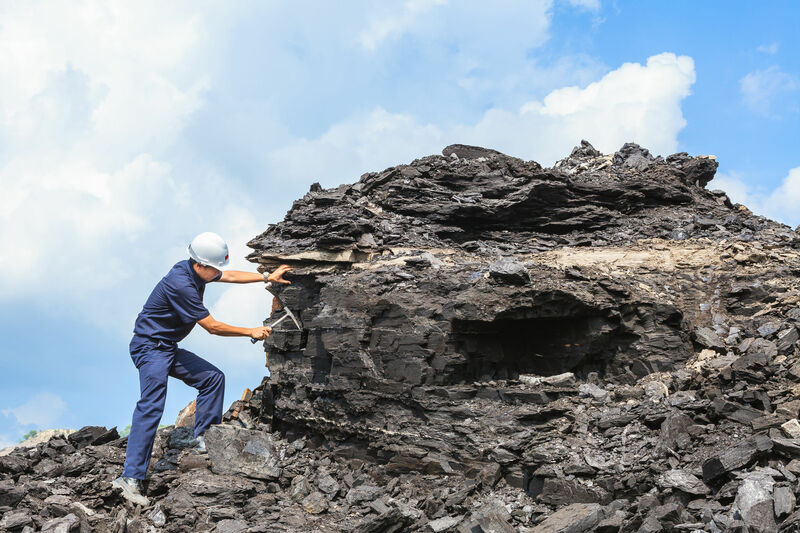 For starters, grès des Vosges (Vosges sandstone) runs in a large, horizontal swath through the Vosges, underneath a granite layer (from which it is derived) and atop a layer of coal. Grès des Vosges is a hard, compact sandstone composed mainly of quartz and feldspar. Its pink-reddish color is due to the presence of decomposing iron (iron oxide, as also seen in red soils such as terra rosa) that occurred as a result of the slow cooling of large masses of magma as it hardened into granite. The process of the coloring of the sandstone is termed rubefaction. Much of the sandstone in the Vosges is still grey, and some is still undergoing the process of rebefaction (or rebéfaction as they say in French). The Strasbourg Cathedral, widely considered to be among the finest examples of late Gothic architecture, is partially composed of grès des Vosges, which gives the building its pink-hued appearance. 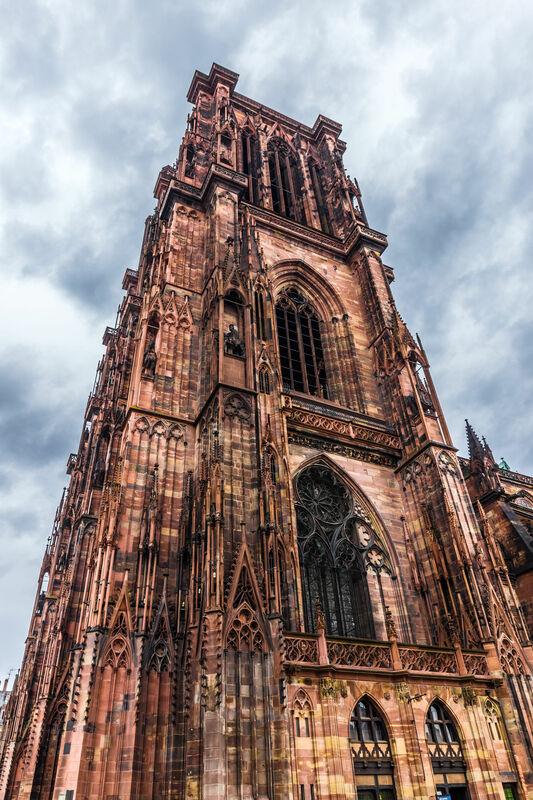 The Strasbourg Cathedral was the tallest building in the world from 1647 to 1874 (227 years). Today, it remains the sixth tallest church in the world and the tallest existing structure built entirely in the Middle Ages. Grès des Vosges is considered a unique aspect of the Vosges Mountains and Alsace—so much so that it has earned Protected Geographical Indication status from the EU. It is also still in great demand as a building material, and as such there is also a trade organization, the Union des Producteurs de Grès des Vosges, built around promoting and protecting the stone. And here I thought it was all about the wine. 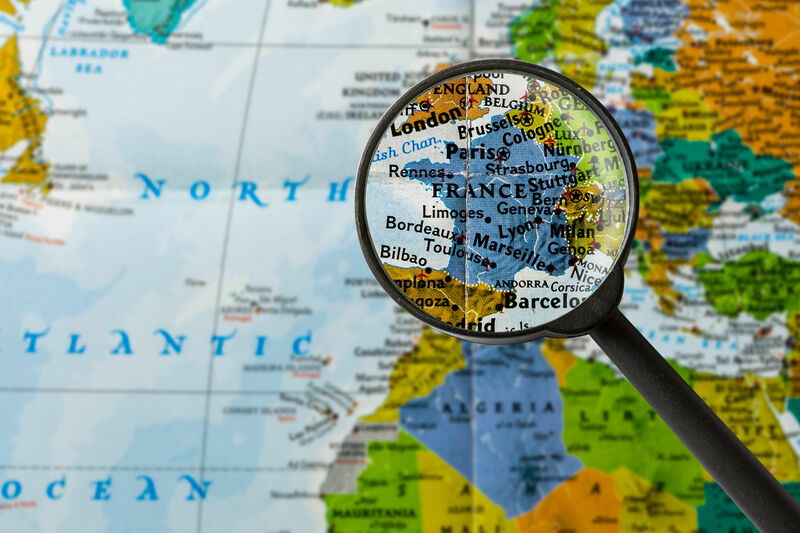 As a citizen of the world, you have no doubt heard by now that in January of this year (2016), after years of debate, the French government reduced the number of the administrative regions in Metropolitan France from 22 to 13. This “simplification” has been dubbed le big bang des régions by the French media. Despite their original intent (and hopefully, eventual success) such changes tend to complicate things in the short term. In this regard, we wish the French well. On a more selfish note, as a lifelong student of wine this means I need to re-do some of my flashcards. 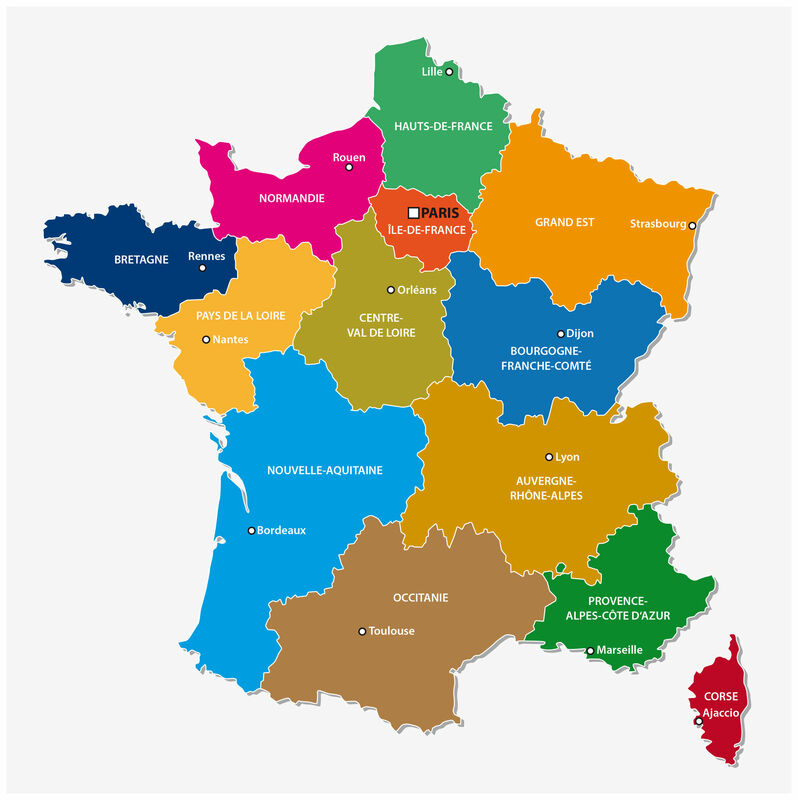 I’m in the process of doing just that, but for now I felt the need to make a quick survey of how these new administrative regions affect the study of French wines! First, some quick good news: A lot of wine study deals in departments, and these have not changed. There are still 101 departments in France, which include: 94 on the mainland, 2 in Corsica, and 5 overseas territories (Guadeloupe, Martinique, French Guiana, Réunion, and Mayotte). Your studies of the Haut-Rhin, Gironde, and Lot-et-Garonne have not been in vain. Grand Est: The newly-formed Grand Est region comprises the former regions of Alsace, Champagne-Ardenne, and Lorraine. The capital city is Strasbourg. That’s right—the Alsace region (technically) is no more. However, the wine region is still referred to as Alsace, and if you look Alsace up in a (non-wine centric) dictionary or encyclopedia, it will define it along the lines of something like “a historic and cultural area of France.” Main wine areas in the Grand Est region include Champagne (parts of which cross over into the new Hauts-de-France region to the northwest), Alsace, Moselle AOC, and Côtes de Toul AOC. Bourgogne-Franche Comté: This new region encompasses the former regions of Bourgogne (Burgundy) and Franche Comté. The capital city is Dijon. 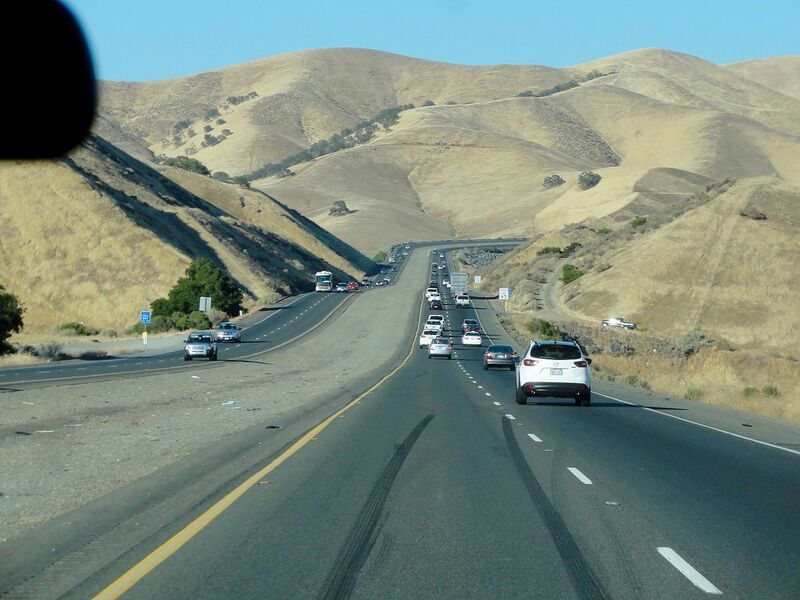 There is nothing too complicated about this region, it is merely the coupling of two former administrative areas into one, with a hyphenated name. Wine regions affected include Burgundy (even Chablis, Irancy, and Saint-Bris made the cut) and Jura. The vineyards of Beaujolais and the Savoie AOC are now partially in the region of Bourgogne-French Comté and partially in the new region to the south (Auvergne-Rhône-Alpes). The good news: the ideal pairing of white Burgundy and Comté cheese now consists of two sister products from the same region. 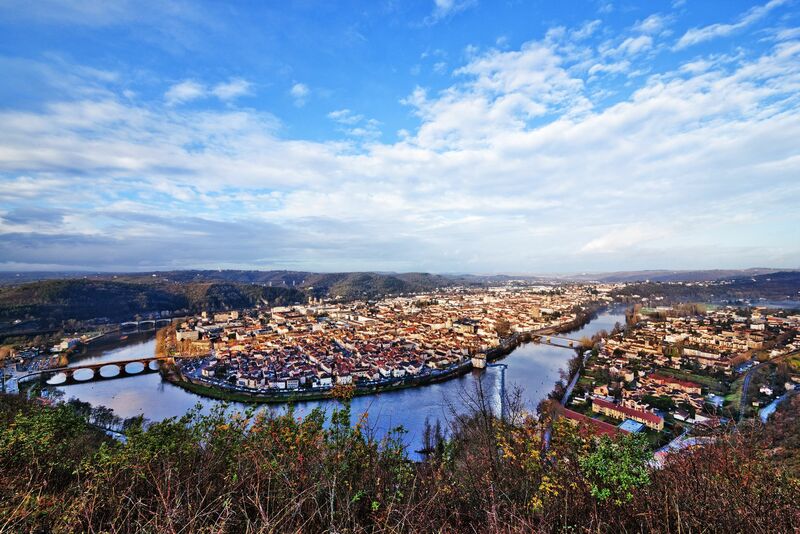 Auvergne-Rhône-Alpes: Like Bourgogne-Franche Comté, this newly-formed administrative region seems to be merely a late marriage (complete with hyphenated name) between two longtime neighbors. The capital city is Lyon. The main wine regions within the new region include all of the Northern Rhône Valley (from Côte Rotie in the north to Saint-Péray at the southern tip) and Grignan-les-Adhémar (of the Southern Rhône), parts of Beaujolais, and parts of the Savoie AOC. 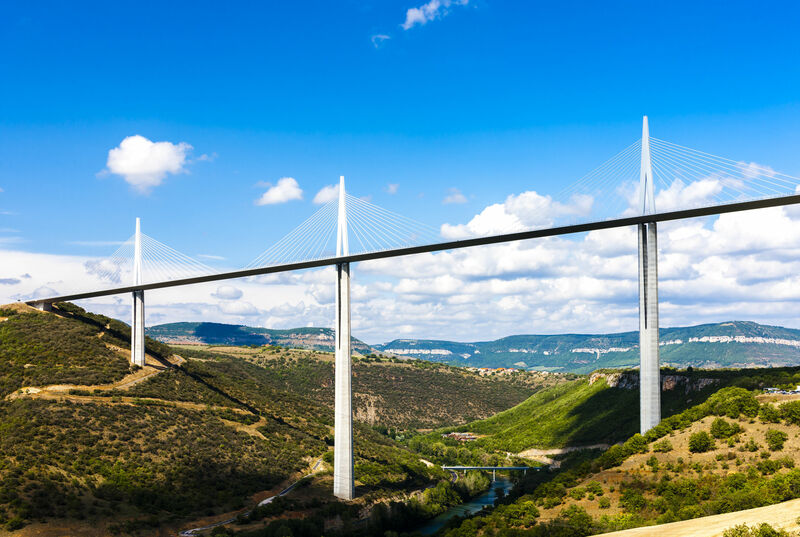 Occitanie: This new region is made up of the former regions of Languedoc-Roussillon and Midi-Pyrénées. The capital city is Toulouse. Just like long, lost Alsace, we will read things like “Languedoc is a former province of France. Its territory is now contained in the modern-day region of Occitanie in the south of France.” (Thank you, Wikipedia.) 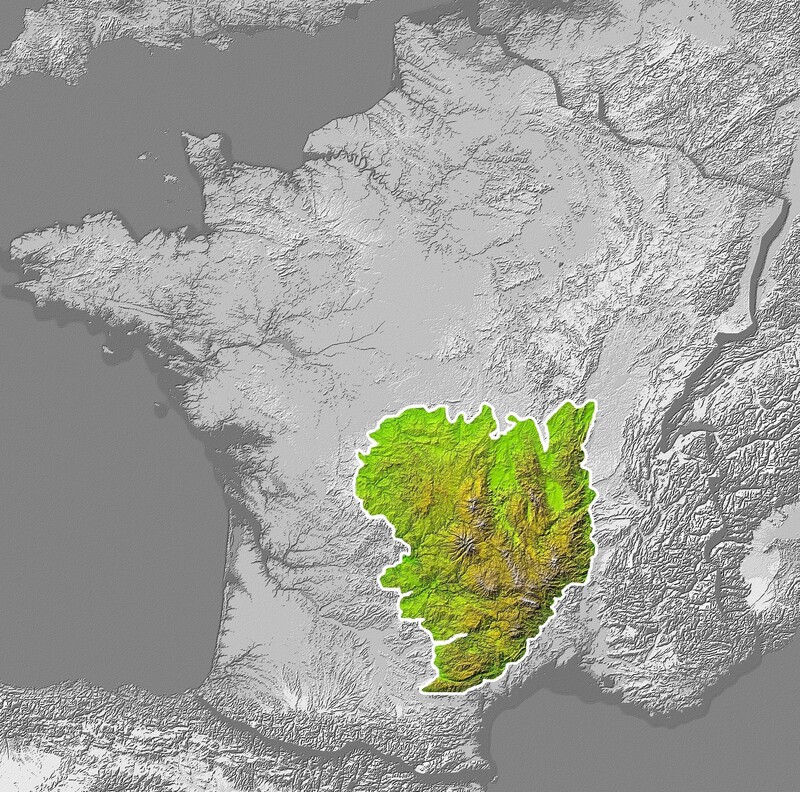 The Occitanie region contains all of the vineyards areas of Languedoc and Roussillon (we knew you well), as well as some of the AOCs of Southwest France, including Cahors, Floc de Gasconge, and Fronton. 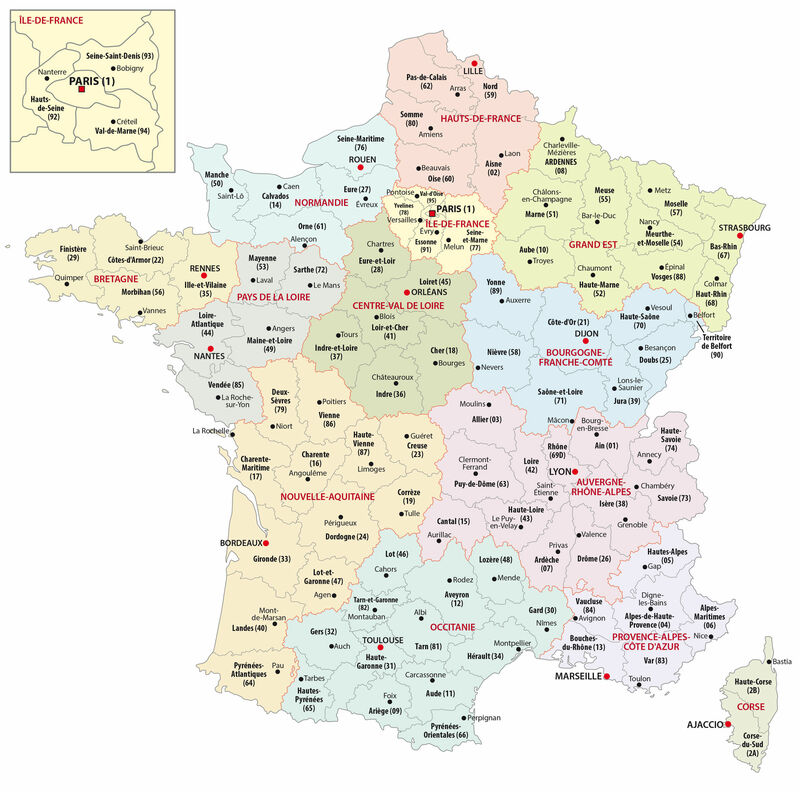 Nouvelle Aquitaine: This new region is comprised of the former regions of Aquitaine, Limousin, and Poitou-Charentes. The capital city is Bordeaux. This new area includes all of the vineyards and AOCs of Bordeaux (thank goodness), all of the Cognac-producing region and most of the Armagnac-producing areas (a portion of which stretches into Occitanie). 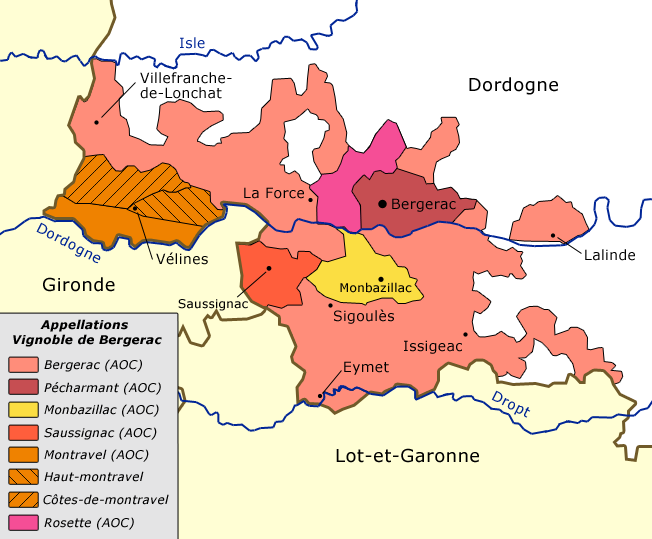 Nouvelle Aquitaine also includes some AOCs of Southwest France, including Bergerac, Buzet, Côtes de Duras, and Monbazillac. Normandie (Normandy): This area hasn’t changed too much; it just combines the former regions of Upper Normandy and Lower Normandy. This totally makes sense to me and seems like an actual simplification. The new capital city is Rouen. Wine production is not really a thing here, but the apple brandy (with its three Calvados AOCs) and the Camembert cheese is quite good. Hauts-de-France: Named for this area’s location at the “top” (haut) of France, this new area comprises the two former regions of Nord-Pas-de-Calais and Picardy. The capital city is Lille. Not much wine production goes on in this northerly spot, aside from the fact that the official boundaries of the Champagne region extend ever-so-slightly into the Hauts-de-France’s Aisne department. Robinson, J., & Harding, J. (2015). The Oxford Companion to Wine (Fourth edition). Oxford: Oxford University Press. 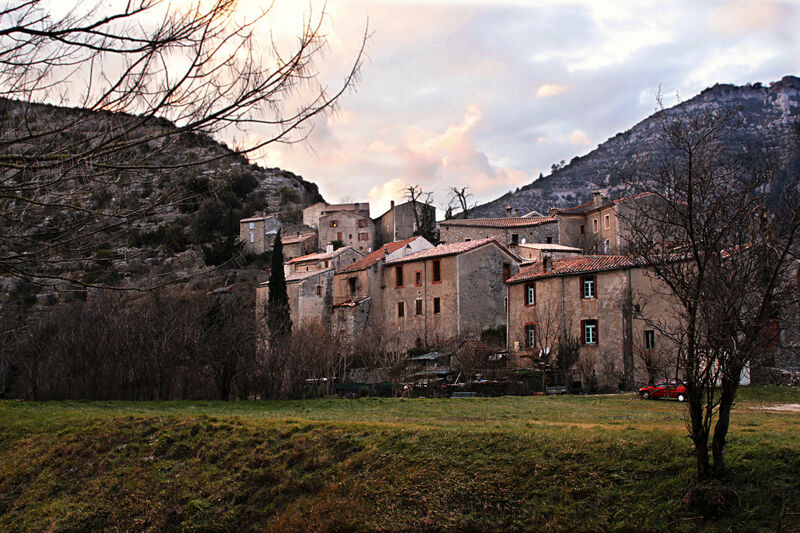 The Lot River has its source in south-central France, in a small mountain range known as the Cévennes. The Cévennes Range is part of, and sits alongside, the eastern edge of the much-larger Massif Central. The highest mountain in the Cévennes is Mont Lozère, rising to 5,575 feet (1,700 m) above sea level. 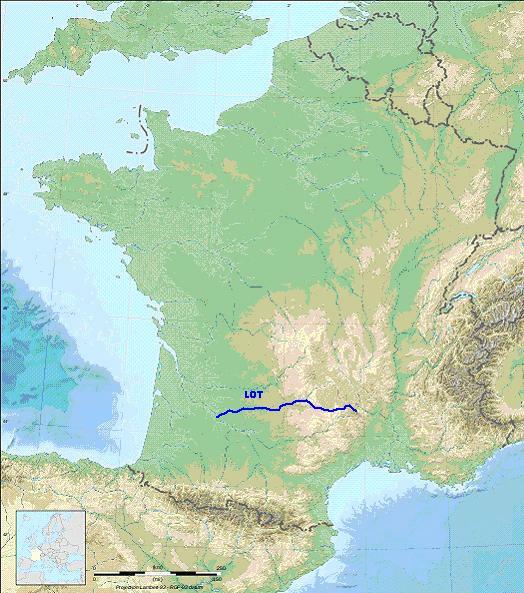 It is here, on the side of Mont Lozère, that the Lot River begins its 300-mile (482 km) journey as a “winding blue ribbon” through the departments of Lozère, Aveyron, Cantal, Lot, and Lot-et-Garonne. Along this path, the Lot River flows through the AOC wine regions of Estaing, Entraygues-Le Fel, and Cahors before joining the Garonne for the final trip to the sea. From its beginning in the Cévennes, the Lot River flows for about 60 miles alongside a plain known as L’Aubrac—named for the small town of Aubrac located on its western side. This high plateau extends almost 1,000 square miles, and was created by a series of volcanic eruptions that occurred over 6 million years ago. The plateau of L’Aubrac is somewhat defined by the Lot River; the Lot River itself forms the southern boundary, while the Truyère River defines the northern border. 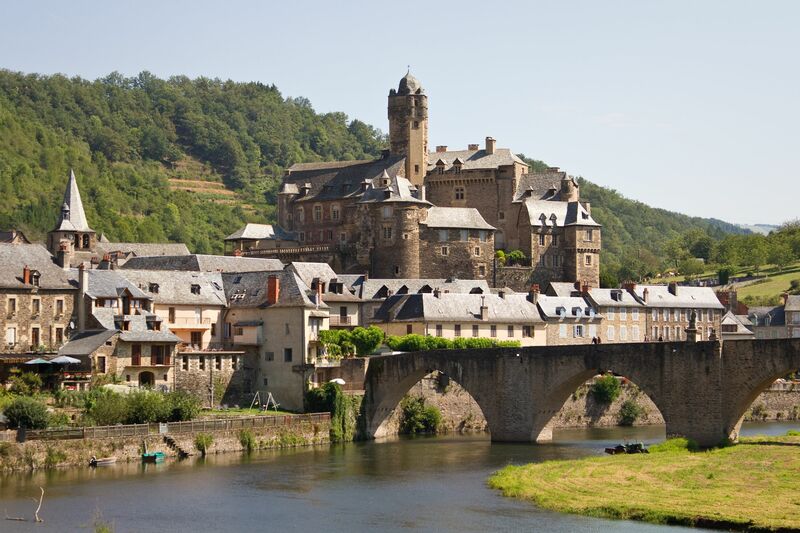 On its journey across the Aubrac Plateau, the Lot River flows through the town of Estaing. Estaing is considered to be one of the most picturesque towns in all of France. Estaing is also the recipient of a rather new AOC, awarded in 2011. The wines of the Estaing AOC are red, white, or rosé, and typically dry (although off-dry styles are permitted). The white wines of the Estaing AOC are based on a minimum of 50% Chenin Blanc and a minimum of 10% Mauzac; the remainder may include up to 25% Saint-Côme (a local grape also known as Rousselou). The red and rosé wines are based on Gamay, with Fer (Fer Servadou) required in the reds, and two accessory varieties (chosen from a long list of allowed, obscure varieties) required in the rosés. The western boundary of the Aubrac Plateau is about ten miles upriver from Estaing, at the town of Entraygues-sur-Truyère. Entraygues-sur-Truyère was founded where the Truyère River (a right tributary of the Lot) flows into the Lot River as it continues its journey down the eastern foothills of the Massif Central. From Entraygues-sur-Truyère, the Lot River twists and turns for about 4 more miles before it reaches the town of Le Fel. Between these two towns you will find the terraced vineyards of the obscure yet delightful Entraygues-Le Fel AOC. This is a tiny AOC, consisting of about 50 acres in total. Red, white, and rosé wines are produced here; they are mostly dry but off-dry styles are allowed as well. The white wines of the Entraygues-Le Fel AOC are based on a minimum of 90% Chenin Blanc; the remaining 10% may comprise either Mauzac or Saint-Côme. The red and rosé wines are blends, based on Fer, Cabernet Franc, and Cabernet Sauvignon, plus small allowed amounts of Mouyssaguès and Négret de Banhars. No single grape may be more than 60% of the blend. 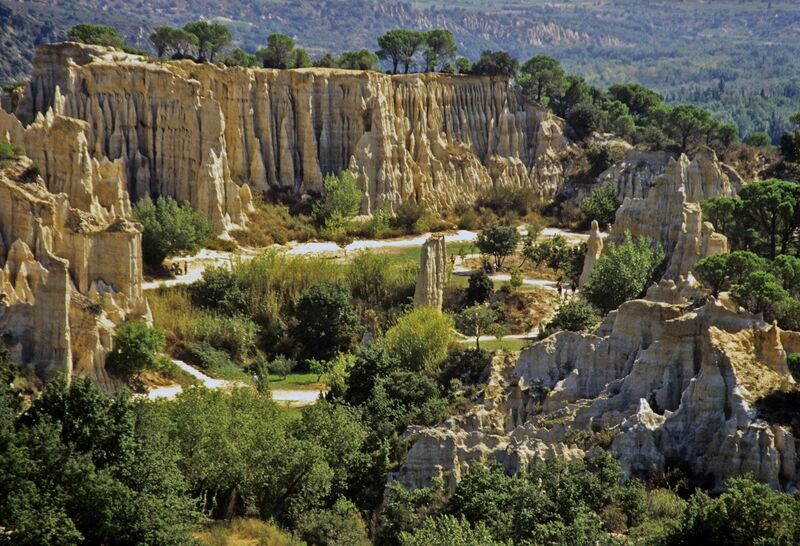 After leaving the town of Le Fel, the Lot River twists and turns through the hills, limestone plateaus, and valleys for about 70 more miles until it reaches the town of Cahors. 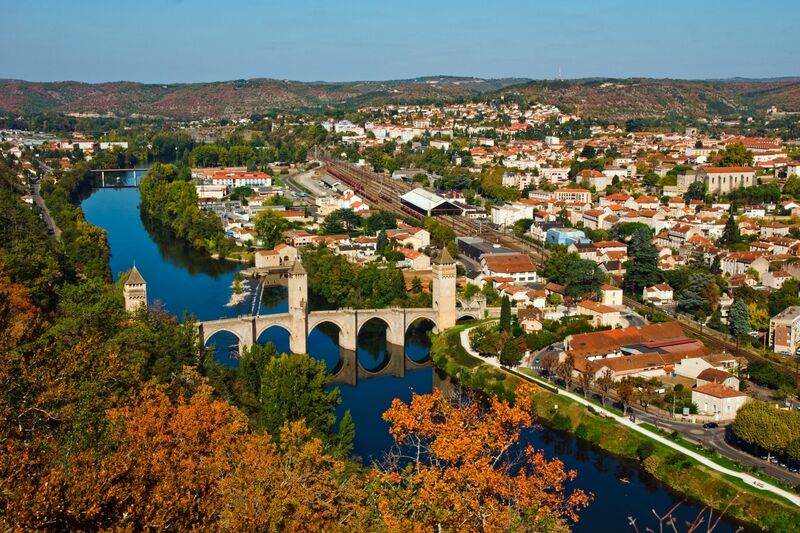 Here, the Malbec-dominated vineyards of the Cahors AOC follow the twists and turns of the Lot River for over 25 miles. Cahors is a red wine-only AOC, producing the deep, dark, spicy wines known as the “Black Wine of Cahors.” Cahors AOC is produced using a minimum of 70% Malbec, with Tannat and Merlot allowed for the remainder. 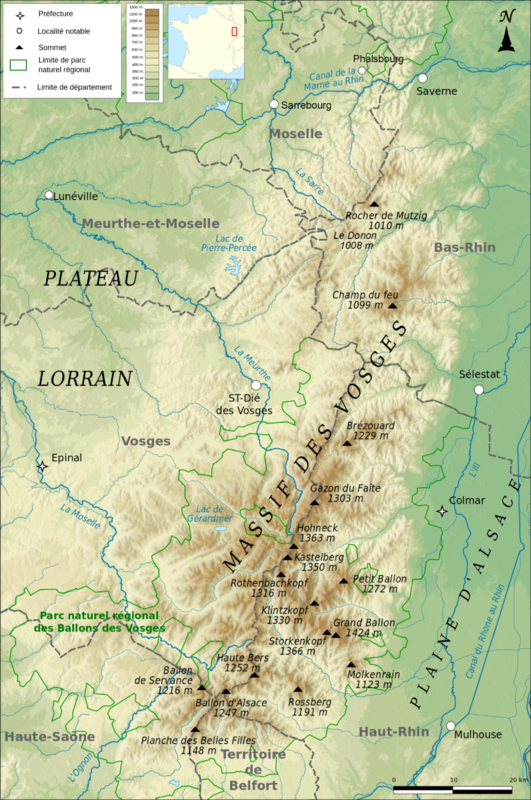 The vineyards of Cahors are planted on two distinct soils; those closest to the river are planted on gravelly slopes, while those farther from the river are planted on the area’s limestone plateaus (known as the Causses). Wines produced using grapes planted on the limestone plateaus are known to be more tannic and austere, while grapes planted closer to the river produce wines that are fruitier and more approachable while young. After the Lot River leaves the vineyards of Cahors behind, it continues to wind its way for another 60 miles before it reaches the town of Aiguillon. At Aiguillon (a commune of the aptly-named Lot-et-Garonne Department), the Lot River joins the Garonne River for its final journey through the vineyards of Bordeaux, into the Gironde Estuary, and finally out to sea. Robinson, J., Hardin, J. & Vouillamoz, J. Wine Grapes. (2012) London: Harper Collins. 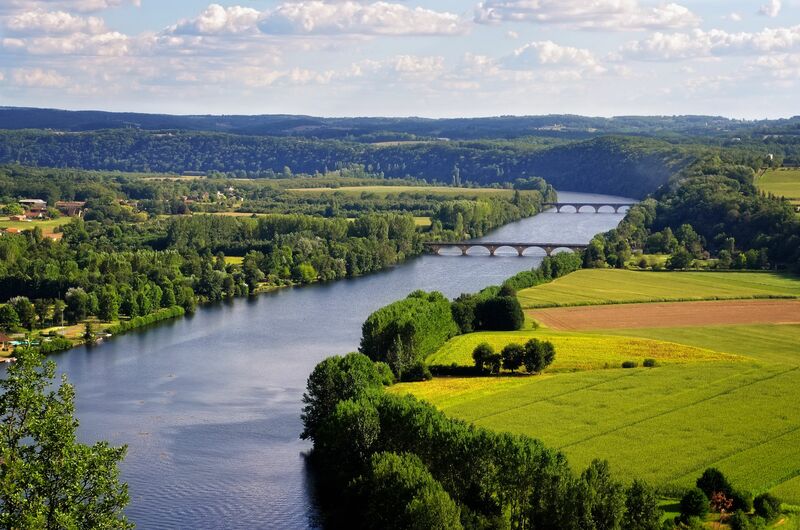 The Dordogne River is well-known as one of the three main waterways that flow through and handily divide the Bordeaux AOC into the areas of the Right Bank, Left Bank, and Entre-Deux-Mers. 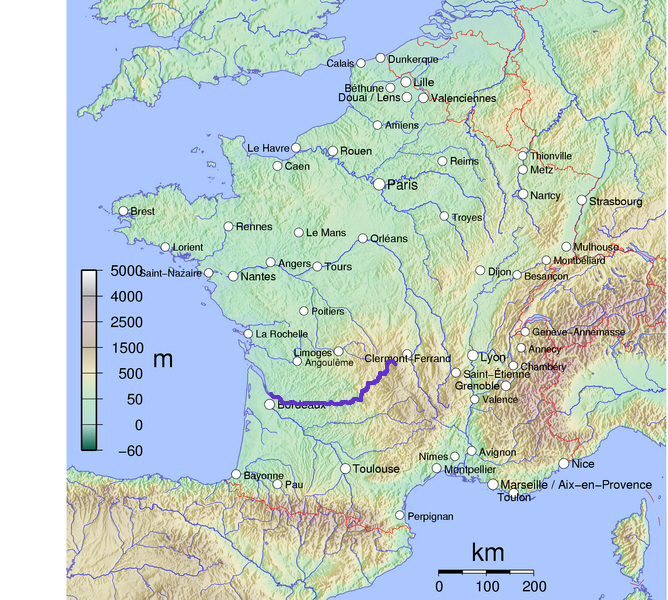 However, Bordeaux is only part of the story of the Dordogne River. The sources of the Dordogne is found almost in the center of France—it’s just a bit too far south to call it the true center. 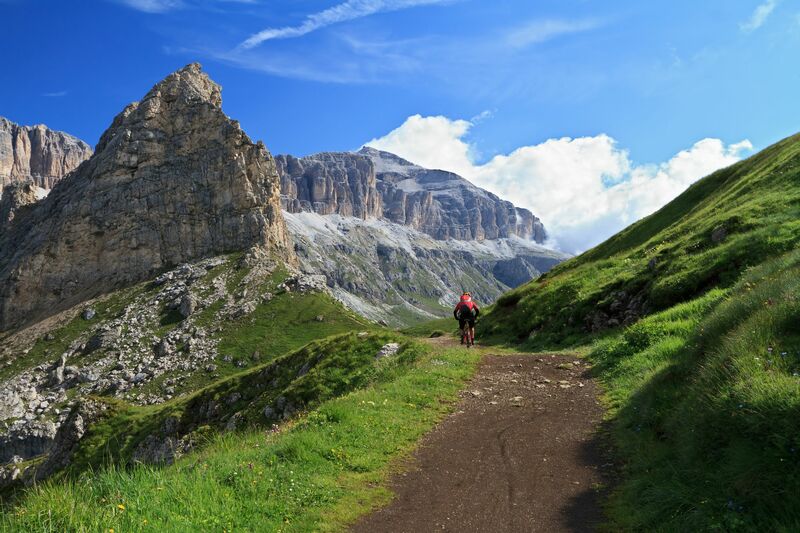 In the mountains of the Massif Central, two small streams—the Dore and the Dogne—arise on the side of Puy de Sancy (Mount of the Cross), which at 6,184 feet (1,885 m) high is the highest mountain in the range. After a bit of meandering around, these two streams flow together and form the Dordogne River. The upper valley of the Dordogne River is a series of deep gorges, cliffs, and lakes. The river then flows through the neighboring countryside, occasionally meeting small towns such as Lanobre (where you can visit the Château de Val [not a wine-producing Château but a well-preserved Gothic Castle]) and Bort-les-Orgues, where you can view the “Les Orgues” volcanic rock formation—which stretches over half a mile and resembles a series of 300 foot-high organ pipes, the result of cracks formed in cooling, prehistoric lava flows. About 50 miles later the river flows through the city of Argentat, a lovely town where medieval houses line the streets along the river. From Argentat, the river twists and turns for about another 100 miles, and just before the town of Lalinde, the Dordogne flows into the Bergerac/Cotes de Bergerac AOC. The Bergerac AOC produces red, white, and rosé wines. Bergerac reds and rosés center on Cabernet Sauvignon, Cabernet Franc, Malbec, and Merlot; also allowing for small amounts of Fer Servadou and Mérille. White wines are based on Sémillon, Sauvignon Blanc, Sauvignon Gris, and Muscadelle; varying small amounts of Ugni Blanc, Chenin Blanc and Ondenc are also allowed. The Cotes de Bergerac AOC occupies the same area as the Bergerac AOC, and produces the same range of wines but with stricter standards for yield and must weight at harvest. The Cotes de Bergerac AOC also allows for a sweet white wine; whites in the Bergerac AOC must be dry. 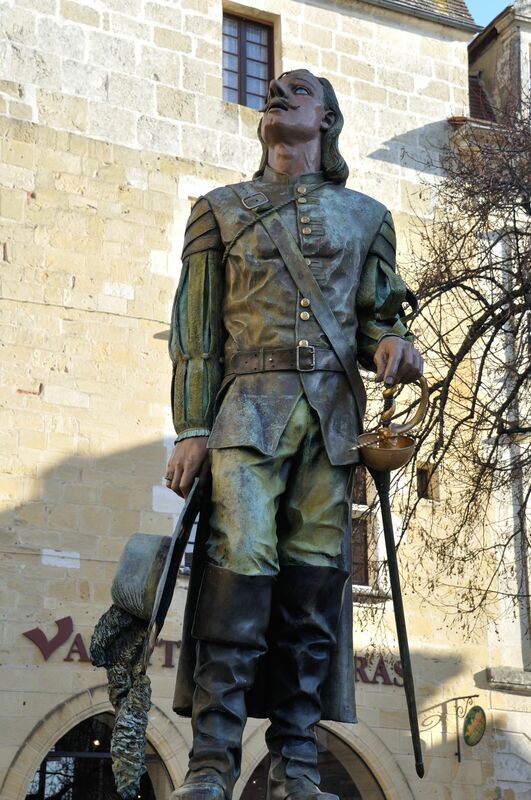 Tucked into the Bergerac AOC, and surrounding the actual town of Bergerac (and its famous statue of Cyrano), we find the Pécharmant AOC. The Pécharmant AOC produces dry red wines only, based on Cabernet Franc, Cabernet Sauvignon, Merlot, and Malbec. Pécharmant is required to contain at least three varieties, and no one variety can exceed 65% of the blend. Following the river just to the west of the Pécharmant AOC, we find two wine regions: Rosette to the north of the river, and Monbazillac to the south—both produce off-dry and sweet white wines. Rosette AOC must contain 2.5%–5.1% residual sugar and is a blend of at least two of the following grapes: Sauvignon Blanc, Sauvignon Gris, Sémillon, and Muscadelle. The Monbazillac AOC is famous for its sweet white wines that are often touted as something of a less expensive “version” of Sauternes. The grapes of the Monbazillac AOC include the principal varieties Sauvignon Blanc, Sauvignon Gris, Sémillon, and Muscadelle; other allowed varieties include Chenin Blanc, Ondenc, and Ugni Blanc. There are few restrictions on the content of the blend, provided that at least 80% of the contents consist of the principal varieties. Monbazillac blanc must contain at least 4.5% residual sugar, and the most famous wine of the appellation—Monbazillac Sélection de Grains Nobles—must contain at least 8.5% residual sugar. Grapes used in Monbazillac AOC wines must be selectively hand-harvested and may be affected by botrytis, but this is not required. While in Monbazillac, be sure and visit the Château Monbazillac which is a historic castle, a modern winery, and a contemporary arts center! To the north of the Dordogne, about 15 miles west of the Rosette AOC (and onward through the surrounding Bergerac AOC), we find the Montravel AOC. The Montravel AOC produces both red and white wines that closely mirror the wines of nearby Bordeaux. White wines are based on a minimum of 25% Sémillon plus a minimum of 25% (combined) Sauvignon Blanc and Sauvignon Gris; other allowed varieties include Muscadelle and Ondenc. The Haut-Montravel AOC produces sweet white wines (minimum 8.5% residual sugar) from the same blend. Red Montravel AOC is based on a required minimum of 50% Merlot and must include at least one other grape variety; allowed red grapes include Cabernet Sauvignon, Cabernet Franc, and Malbec. For about 15 miles, the Dordogne River forms the border between the wine regions of Bergerac and Montravel (on the north bank of the river) and Saint-Foy-de-Bordeaux (on the south bank). Just past Saint-Foy-de-Bordeaux, the Dordogne dips inside the Bordeaux AOC and creates the boundary line between Bordeaux’s Right Bank and Entre-Deux-Mers. Somewhere between the AOCs of Fronsac and Margaux, the Dordogne River joins the Garonne and together, as the Gironde Estuary, they make their way into the Atlantic Ocean.